What color is the Red stain? I want the barn red paint or stain and when I look up crystal cabinetry they don't even carry the color?????? Thank you!! When I am done I will send in a pic!! I am assuming I have to find someone to build this right? Kitchen - What are the dimensions of the kitchen.....and length of sink cabinet to end of hutch cabinet area? Unfortunately I don't have the exact dimensions, but the end of the counter to the edge of the sink is approx. 6 1/2 feet. Hope that helps. Thank you...how about to the left of sink? What size sink did you use? What is the red paint color used in this pic? Very lovely, thanks for posting. Valspar's Currant Red is a similar color. It also has a Van Dyke Brown Highlight on it. Just came across your post and question. It is a red stain we called Old Barn, and the cabinets are birch. Both are available through dealers of Crystal Cabinets by special request. What stain colour is used on the floor? Is it oak? The grain is oak. The stain looks custom. What is the depth of the plate rack cabinet? Yes. Any color you can imagine. They do paint and stain matching. Crystal Cabinetry. Where did you get the tin drawer inserts? - Where did you get the tin drawer insets? Are they custom? The inserts are something that Crystal Cabinetry offers. Is there a black glaze on these cabinets? How was the darker distressed look achieved? Its a van dyke brown highlight. Is this an 8' ceiling in this kitchen? Warmth and classic lines make these red cabinets the statement in this kitchen. 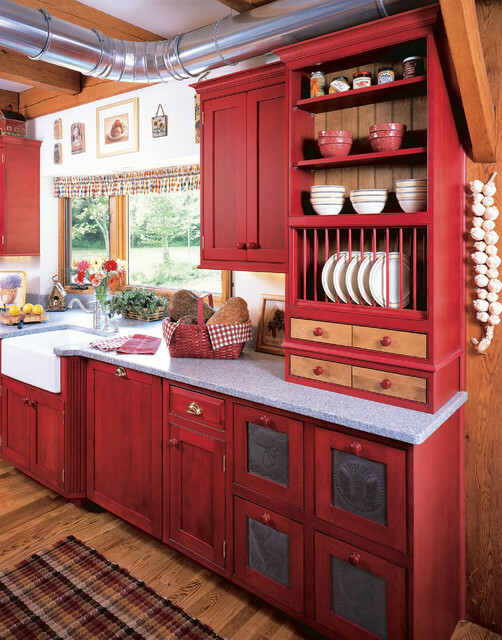 Red cabinetry, especially if it's stained rather than painted, can give a kitchen a warm, traditional country feel. It goes well with the the warm tones of the natural wood too. is barndoor red too bold for doors in kitchen? Four Hands Furniture Tuscan Spring Extension Dining Table, 72"/96"
Rockwell Apron-Front Kitchen Sink, 33"
Latoscana Reversible Fireclay Apron Sink, White, 30"